Snack Takeaway Playa Blanca There are 10 products to choose from. Takeaway Lanzarote - Restaurants Playa Blanca Nachos with Chicken : chicken , jalapenos, cheese & sauce. 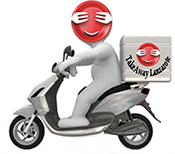 Takeaway Lanzarote - Restaurants Playa Blanca Squid Rings Romana with salad and chips.